COLOMBO, Sri Lanka (AP) — President Mahinda Rajapaksa, criticized internationally for his conduct of the war against the Tamil Tigers, has been all but crowned king inside Sri Lanka. In the weeks since Rajapaksa declared victory in the country's 25 year civil war with the rebels, a string of music videos have praised him as the nation's savior. Giant billboards with his image have been erected across the capital. He has been hailed as the modern-day incarnation of a warrior king who unified this island nation more than 2,000 years ago. "He is a lion. He is the father of Sri Lanka," said R.S.P. Nishantha, a 38-year-old tennis instructor. "He has done what others did not dare to do." Though many in the Tamil minority disagree and have expressed distaste with the nonstop celebrations, these are heady days for Rajapaksa, a provincial politician who just barely won election in 2005. 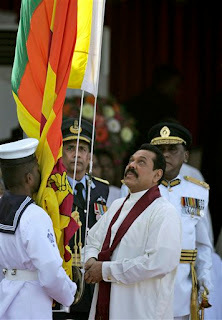 Embracing his role as the standard bearer of Sri Lanka's mainly Buddhist Sinhalese majority, Rajapaksa embarked on a victory lap across the country after the military routed the Tamil Tigers two weeks ago, ending their dreams of a separate homeland for mainly Hindu Tamils in the north and east. He addressed tens of thousands of cheering Sri Lankans at a rally outside parliament. Sri Lanka's top Buddhist monks presented him with the highest national honor, essentially naming him "Guardian of the Sinhalese nation." He made a pious offering at a sacred tree believed descended from the Bo tree where the Buddha gained enlightenment. "My dear son, daughter. I am the happiest head of state to see a younger generation that so loves its country," he told a parade Wednesday that was billed as the final victory rally. "I am the proud father of that generation." What Rajapaksa will do with his new popularity is not yet clear. His term expires in 2011, and with the opposition in disarray he seems to have little competition for re-election. His ruling coalition has already won full or partial control of every province in a string of polls timed to coincide with successes on the battlefield. Jehan Perera, a political analyst from the dovish National Peace Council, said he cannot remember a Sri Lankan leader with such overwhelming popularity among the Sinhalese and expects Rajapaksa to further consolidate his power.